3. Disconnect the anti-lock sensor wire. 4. Remove the bolt and the parking brake cable bracket. Discard the bolt. 5. Remove the stabilizer bar (5A772). 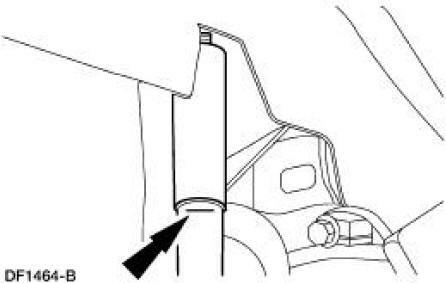 For additional information, refer to Stabilizer Bar in this section. 6. Support the differential housing with a jack stand. 7. Position the special tool 014-00942 under the rear lower suspension arm and bushing-to-axle pivot bolt. 8. Remove and discard the pivot bolt and nut. 9. Remove the spring (5560). 1. Slowly lower the arm with the special tool 014-00942. 2. Remove the rear spring and the rear spring insulators (5536).